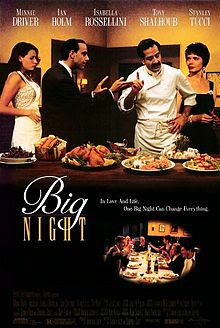 Aunt Mary recently turned us on to Big Night (with Tony Shalhoub and Stanley Tucci) which we thoroughly enjoyed. But when we googled Louis Prima, we were shocked and delighted to find he's the Dixieland jazz musician behind many familiar tunes. Jungle Book's King Louis "I Wanna Be Like You"
Elf discovers New York: "Pennies From Heaven"
Back to the Future: "Night Train"
After Big Night we had omelets and buttered pumpernickel (for lack of a nice hunk of Italian bread). Bill remedied that by picking up some delicious Italian bread on the way home from work! We're on an Italian kick now.